Widett Circle was a key piece of the now-dead Boston 2024 Olympics plan. Widett Circle won’t become the home for an Olympic stadium, but that’s not stopping Mayor Martin J. Walsh’s administration from moving ahead with crafting a vision for the industrial area off the Southeast Expressway. Sara Myerson, Walsh’s new executive director for his Imagine Boston 2030 planning effort, said it’s likely that some elements of the Olympics-related plan to build an 8 million-square-foot, mixed-use complex over the railroad tracks at Widett Circle could remain a part of any proposal. But Myerson said the administration will take steps from the start to seek community input. And it’s possible the pricey deck envisioned by Olympics planners to accommodate construction over the tracks might not be part of the project. 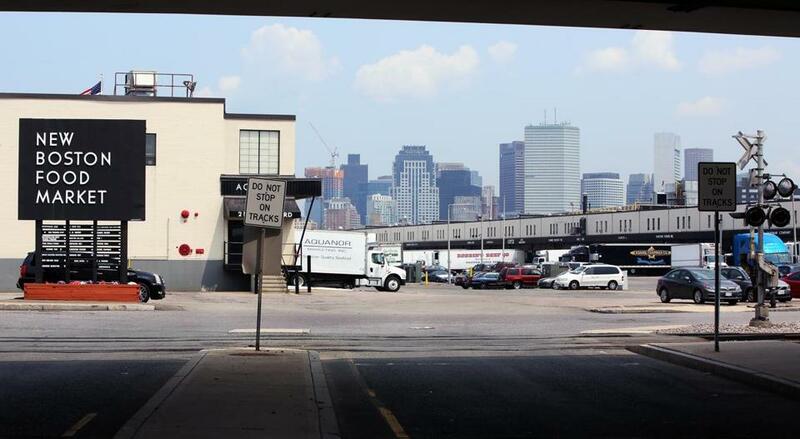 The mayor, meanwhile, plans to meet with the wholesalers who operate the New Boston Food Market warehouses at Widett Circle sometime after Labor Day to open a discussion about the Widett project. The 20 or so companies in the cooperative would probably need to move from their 16.4-acre site to a new location before redevelopment could occur. 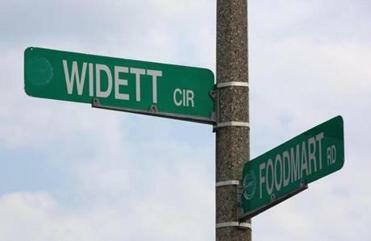 Signs at the intersection of Widett Circle and Foodmart Road. Read: So what exactly is Widett Circle? “The Olympic process really brought to light, in a lot of people’s eyes, the area of Widett Circle and started to get people thinking about the possibilities there,” said Myerson, who joined the Walsh administration in April as the mayor’s point person on Olympics planning, before shifting to the Imagine Boston 2030 effort this month. Widett Circle became a focal point last year when Boston 2024 singled out the area for a temporary stadium for the 2024 Summer Games. 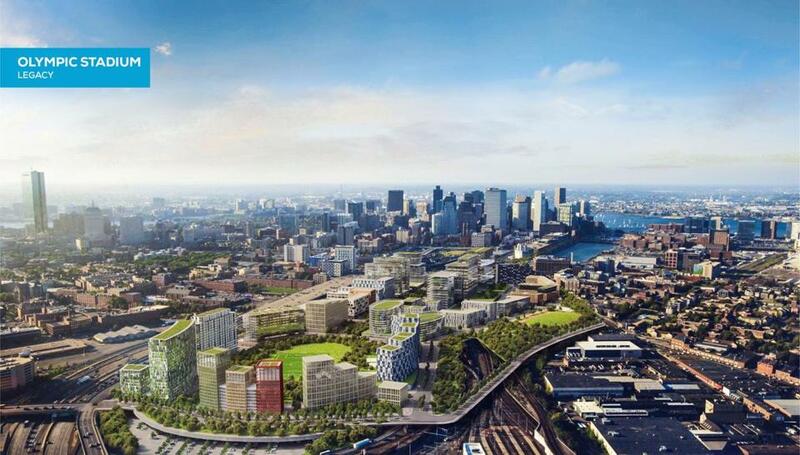 Boston 2024 wanted to line up a master developer for the 83 acres, with Widett as its focal point. The city, Boston 2024 argued, could use tax breaks to entice that developer to build a massive structure over the tracks that bisect that area, weaving together a new neighborhood. The total infrastructure costs could exceed $1 billion. The factors that made Widett attractive at the time — its proximity to the Red Line, the highway and downtown — didn’t go away when the US Olympic Committee dropped Boston last month. But the site’s challenges didn’t disappear, either. Myerson and her team will need to decide if it’s more cost-effective to develop that area without a deck over the tracks — using a more piecemeal approach on either side of the tracks — or to find a developer that would help finance a massive platform. Myerson said she’s not sold on the idea of building the deck because of the price but recognizes that could be the best way to unlock the potential of the area, which lies between South Boston and the South End. “Without that infrastructure piece, it’s hard to have a truly unified neighborhood there that actually can be connected to the surrounding neighborhoods,” Myerson said. The Kraft Group’s search for a new home for its pro soccer team, the New England Revolution, could complicate matters. The Krafts have focused on an 18-acre piece of the Widett area that the city uses for public works storage, fleet maintenance, and a tow lot. The Widett redevelopment will probably be one of the most high-profile changes put in place by Walsh’s Imagine Boston 2030 plan, which is expected to be done in 2017. On Thursday night, the Boston Redevelopment Authority took the next step in the process when it selected New York-based HR&A Advisors to work with Boston’s Utile in running the master-planning effort. Myerson said it’s not clear when Boston would seek a developer for Widett. City officials, she said, need to have a better idea of what they want built. The wholesalers probably won’t want to wait much longer for some answers, though. Boston 2024 had been negotiating to find a new home for them in Marine Industrial Park, on land in South Boston controlled by the Massachusetts Port Authority. Massport’s chief executive, Thomas Glynn, said officials at the authority plan to meet with a broker representing the wholesalers this month to discuss what they would require. “We’re patient, but at the same time it gets a little stressful to wait and wonder and not be in control,” said Marion Kaiser, chief executive of the seafood distributor Aquanor Marketing at the New Boston Food Market. Boston 2024 developed renderings for what Widett Circle might look like after the Games. Now, city officials promise to seek public input about redeveloping the area. The development lawyer Marc LaCasse predicted that Walsh’s effort to rely on community input for Widett will pay off. LaCasse pointed to a similar process that took place on the other side of the expressway, for the Harrison Avenue corridor in the South End. That initiative took more than two years to complete but led to a rezoning that allowed taller buildings, a change that was widely accepted by nearby residents. Myerson said she expects city officials will also take a closer look at Columbia Point in Dorchester — Boston 2024 wanted to put an athletes village there — with an eye toward improving the street grid. Other underutilized areas could also be identified for development by HR&A and Utile.